Men of the Cloth is an inspiring documentary of three Italian master tailors who confront the decline of the apprentice system as they navigate their challenging roles in the twilight of their career. The film unravels the mystery of their artistry and reveals how their passionate devotion to their Old World craft is akin to a religion. Perhaps you will be passing through O'Hare tomorrow afternoon and would like to take a little Chicago with you? Or, share this message with friends or family traveling this week! We are excited to be a featured vendor at the Holiday Delights Fashion Market on Friday, December 20, 2013 at O'Hare Airport. In partnership with the Department of Cultural Affairs and Special Events (DCASE), the Chicago Department of Aviation (CDA) is hosting holiday fashion markets at Midway and O'Hare, where local fashion designers and independent retailers will offer unique gifts for sale including accessories, apparel and jewelry. Nicholas Joseph will be featured at O'Hare on Friday, December 20 from noon to 5 p.m. in Terminal 3 in the hall between Concourses K and L.
"On behalf of Mayor Rahm Emanuel, the Department of Cultural Affairs and Special Events is pleased to provide a venue where Chicago's talented fashion designers can showcase their unique creations to visitors from around the world," said CDA Commissioner Rosemarie Andolino. "More than 230,000 passengers travel through Chicago's airports each day. We hope many will have the opportunity to visit the Holiday Delights Fashion Market." Need that special gift wrapped? We have got you covered! Complimentary gift-wrapping services will be offered at O'Hare near the fashion market as well as in Terminals 1 and 2. The CDA's complimentary gift-wrapping services will continue to be available on December 23 and 24 at both airports. You can always buy custom clothing gift certificates online as well. 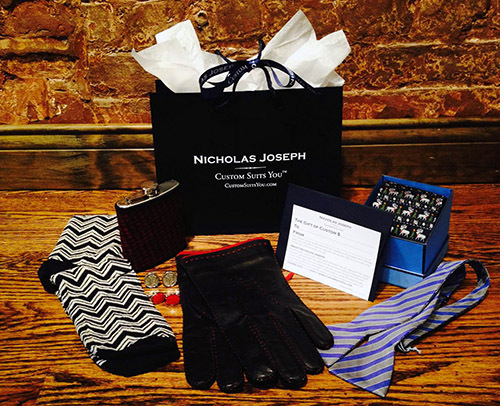 Happy Holidays from the Nicholas Joseph team! Our Groom's Looks on ABC's Windy City Live, see the video! Are you planning your wedding or know someone who is? 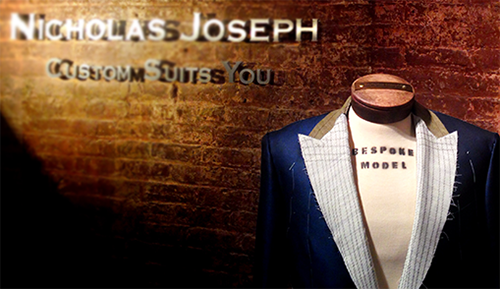 Check out the latest in Groom's attire on ABC Chicago's Windy City LIVE! Summer Dream Wedding segment. We have models showcasing the Classic Tuxedo, Old-School White dinner jacket, Dressy alternative (3 pc suit), and Trendy formal velvet dinner jacket looks. And due to an issue with a model, Nicholas even had to step in as a guest model! We're also happy to show you all the looks in our showroom if you Make an Appointment, or check our our Wedding Gallery.